As residential remodeling becomes more and more poplar, home design trends continue to change from year to year. This year, several new trends in front entry doors emerged, including the Grand Entrance door — which makes a strong statement about your home even before visitors step inside. As far as this trend goes, it seems that bigger is better! Tall doors, often eight to nine feet tall, continue to gain popularity. Even in smaller homes, a tall often makes an even grander statement than the same door in a larger home. Along with a large door, large, impressive-looking handles complete the Grand Entrance aura. Though these entrances may be grand, the trend ironically leans towards simplicity. Instead of impressive designs or bright colors, basic paneling and darker colors remain the norm. The dark color of the entry door is thought to denote sophistication and leads to a higher resale value. Neutral colors also tend to be popular. 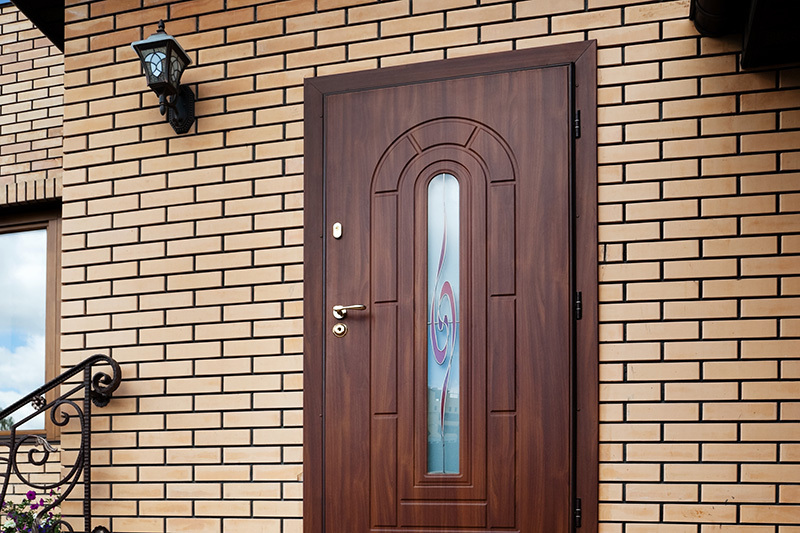 Despite this simplicity, it is becoming increasingly rare to see solid wooden doors. Most Grand Entrances will use windows to increase the aesthetic of the entry, creating a more refined, simple look. Recent trends in interior doors for homes also include simple, cost-effective solid wooden doors with attractive paneling. Popular brands and styles such as Rockport, Craftsman and Santa Fe styles remain a common trend. An emerging trend can be found in the more decorative and stylish French door. While not necessarily a new style, interior French doors are increasingly popular when featuring glass or vintage styling. The vintage look in several different door styles also enjoys increased popularity, including doors once used in offices with lettering. Sliding doors such as farm doors have also become popular for the way they help to optimize space. Trends in residential door hardware branch out in two directions — statement and attractiveness. In conjunction with the recent trend towards a Grand Entrance front entry door, hardware, specifically handles, on front entry doors has been growing larger and more impressive. The intricately designed handle may soon be replaced by a more industrial and impressive large handle. Moving inside, interior hardware traded in simple steel for polished nickel. This material appears more attractive with its gold undertones and smooth feel. Another interior hardware color trend is black. Black handles are simple but look good with any color of room and still make a statement themselves. The general trend — understated industrial; simple yet strong. For more information about trends in doors and hardware from SAHR Building Supply, please contact us here or call us directly at 855.724.7934.